Cindy at Princess Bookie is at it again! 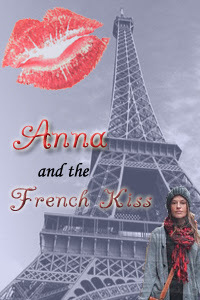 This time she has a contest going to redesign the cover of Anna and the French Kiss by Stephanie Perkins. I want to read this book so badly I can taste it, so I knew I'd be participating in this one! What do you think? I was pretty happy with how it came out, although I wish the girl in the picture was smiling a little more :). Nonetheless, here is my creation and I hope it does well!